The Michigan Department of State reported 3,709 deaths in the state in December of 1917. The enumeration is very matter of fact. The 30 deaths attributed to influenza are insignificant compared to pulmonary tuberculosis (546 deaths), and violence (256 deaths). A local soldier's letter reproduced on the front page describes a measles outbreak and quarantine at Camp Dix in New Jersey. In the UK (some) women were given the vote. 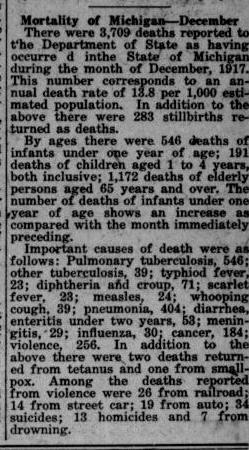 Source: "Mortality in Michigan," The Daily Banner, Belding, Michigan. February 6, 1918. Page 5, Column 7.